So, click on the image above to print out the flyer and pick up free samples of the new UV Expert Neuroshield Sunscreen. Then, forward the flyer to as many friends as you have in your email list! 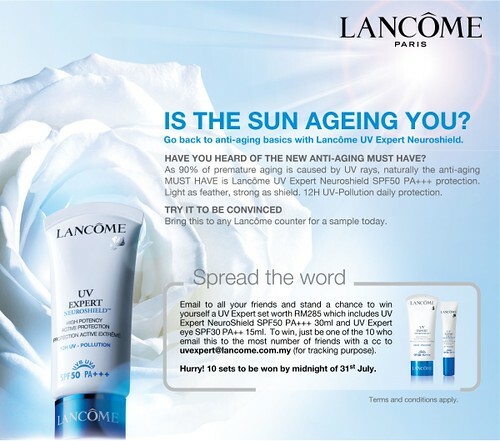 Just remember to cc uvexpert@lancome.com.my in your emails so they can track you and you stand a chance to win a full size UV Expert set. Note: Promotion valid in Malaysia only until 31 July 2009. NEXT POST: Ask & Answer: What’s the difference between blush and bronzer? Aw, it’s Malaysia only. I wanted to try this sunscreen, since it’s highly rated in Japan ever since I came out early this Spring. That’s quite a feat considering how competitive the Japanese market is. The sunscreen, composes of both physical and chemical ingredients, so I may have to skip out on this one since chemical sunscreen ingredients can be irritating for sensitive skin-types like me. But I hope whoever the lucky winners are, they’ll be happy ss since it’s a good-quality product they’re getting! Got my sample from the Jusco counter in 1U – the SA didn’t take down my details – good luck! I took it up for you and you should not have anymore problems at that counter. If you’re in the area perhaps you could try again? Thanks for your help..will go again these few days..cant wait to try it out!! Yay..i have won the contest…and left my details and etc to the gal who is in charge…but there is no reply from her though….m worried now as she said tat i have to reply her b4 24th July and I did….